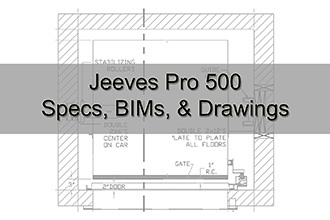 Jeeves Pro 500: The Jeeves Pro 500 is the largest dumbwaiter allowed by code. The cab is constructed of powder coated steel, and can be upgraded to stainless steel. A floor loading option is available, allowing carts to easily roll into the cab. Standard size of 36”w x 36”d x 48”h. Travels up to 6 stops and 80 ft.